Weardale Motor Services have a superb fleet of executive coaches. Our fleet is painted in the Renowned red and white livery which is a familiar sight travelling along the highways and byways of the North East, UK, and Europe. We have executive coaches ranging from 33 to 61 seats, which are highly specified for your comfort. From wedding guests to blue chip conference delegates Weardale Motor Services are experienced in all group transport requirements. If you need to move a group of people in comfort then you are in safe hands. Our family have been in business since 1926. We have a wealth of experience in handling groups of all sizes and our vintage fully restored double decker is ideal for transporting your wedding day guests. Our fleet of modern coaches can provide you with an ideal solution and we have a back up service that is second to none. Something worth considering when planning those special occasions. We have experienced, uniformed drivers and you can rely on their expertise. Please discuss your coach requirements with one of our friendly staff and of you require refreshments for your delegates please let is know as this can be organised for you. 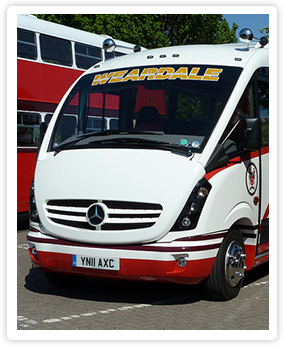 For a successful school trip Weardale can offer you a service without compromise. We have a new fleet of coaches with the latest safety equipment. We have over 80 years experience, and a long list of schools that use our services. Day/sport/Holiday/study/Ski trips we can arrange any kind of school trip for as long as you need in the UK and Europe. Whatever you want to do, we can offer you an excellent service at a competitive price.